I am incredibly excited about publishing What Would Maisie Do? I'm not sure I told you the complete story of how the book came to be, so here it is. 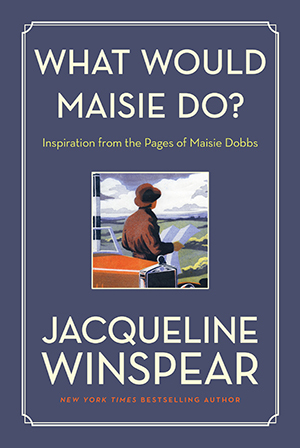 Almost as soon as the first book in the Maisie Dobbs' series was published, readers were asking me if I would write a book about "Maurice's wisdom" or "Maisie's advice"—and many shared stories of how a certain passage in the book had inspired them in some way. In those early days I couldn't see a way to produce such a book—I certainly didn't think I had enough material. But the requests kept coming in, year after year. At once I knew I wanted to make something I hadn't made before—something that had color, texture and that seemed to touch the very best of others—but I'm no artist, and I'm not a poet, so I went back to something I had already created and asked myself, "What next?" And I began to create What Would Maisie Do? I made a mock-up of the book that was in my mind's eye and I wrote some of the content. I wanted to create something that would become a (for want of a better description) "living document"—a book that was also a journal, and that was based on passages from the Maisie Dobbs series that were most beloved by readers. I wanted to bring people together through the character of Maisie Dobbs—I guess I wanted to do some beckoning of lovely of my own. That little mock-up of mine made its way along the line to the amazing people at Harper Design, part of the Harper Collins publishing company, who produce my series, and those talented souls created something quite amazing with the idea and the content—which comprises readers' favorite passages together with the "backstory" describing my inspiration for each piece, followed by a question for the reader; something that Maisie Dobbs might ask you personally. There are photos of locations found in the novels, and there are pages with the beloved epigraphs used to open the novels. Most important are the journaling pages, so it really becomes a living document, to be used alone or even in a group of like-minded readers. And now this dedicated What Would Maisie Do? website is here, a "community page/meeting point" for readers of the book and the series, to share the personal experience of answering Maisie's questions.